Shinya Tsukamoto's newest movie "Kotoko" shows a woman whose life is destroyed by her madness-induced hallucinations. 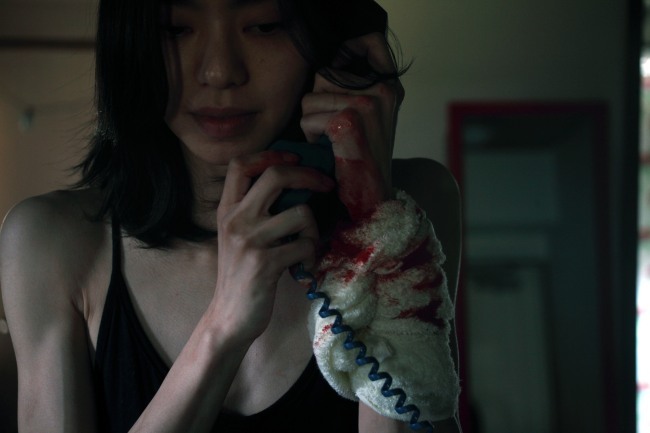 A bold view on insanity as seen from within, the film has divides audiences worldwide at festivals already, while it's still months away from its own domestic release. Even here at ScreenAnarchy we have different opinions on the film. Some have put it in their best-of-2011 lists, while others hate it with a vengeance. In Rotterdam it was no different, although in general the audience turned out to be quite positive by awarding the film an average rating of 3.7 out of 5: definitely not bad for a film with a reputation of making people very uncomfortable. Uncomfortable or not I think the film is one of Tsukamoto's best yet, and the J-popstar playing the title character turns in a performance which is nothing short of fantastic. Kotoko often sees people double. One is a real person, while the other is an imagined counterfeit version who sometimes will act in a threatening way, attacking her or her young son. As Kotoko is not able to tell which version is real and which version is imagined, this "double vision" tends to get her into trouble. But as the stress of taking care of her toddler as a single mother increases, Kotoko's hallucinations worsen and she starts to become a threat to her environment, including her own son. When Child Protection intervenes and takes her boy away from her, Kotoko tries to get her life back in order. But with her condition, should she even be striving to get reunited with her son? To be honest I wasn't really looking forward to seeing Tsukamoto Shinya's "Kotoko". As a parent with young children at home I have noticed that some subjects have become too painful for me to watch. A few years back I saw Paul Solet's horror film "Grace" and it just about murdered me, as it brought some fears and memories to the forefront which I had difficulties dealing with. Friends who had seen "Kotoko" were quick to warn me that it would be cutting rather close to the bone, and the IFFR's own webpage about the film basically warned people away from seeing it (strangely enough). ... and was promptly rewarded with one of the best films this year at the festival. Yes, it's tough on its viewers especially if they happen to be parents. But few films can claim to give such an uncompromising view of what it must be like to be crazy, as seen from the inside. Cronenberg's "Videodrome" comes to mind, or Polanski's "Repulsion". Both of these films are not the easiest to watch, especially when seen for the first time, and "Kotoko" is a lot like that. I would even place Tsukamoto's film squarely in the middle between the two others I just mentioned. And the affliction Kotoko suffers from is not that far removed from what we encounter ourselves a couple of times each day. The moment some stranger speaks to your kids in a supermarket, no matter how well-intended, alarm bells will go off in your head and you can almost see a scenario where you are supposed to act if those people turn out to be a threat. Only for Kotoko it's not an almost. For her, the alarm scenario is just as real as what happens in front of her, and she cannot distinguish between the two. Tsukamoto films this horror with a claustrophobic intimacy, but allows colorful moments of beauty and humor to shine through as well. Even though the subject is as heavy as lead the execution sometimes borders on whimsical, allowing Kotoko's imagination to go to some unexpected corners. When some of the truly disturbing images near the end appear, the context thankfully shows they cannot possibly be real except for in Kotoko's diseased brain, which makes things somewhat more bearable for the audience. In contrast, some of the things which are NOT shown actually leave a bigger impact because they (gulp) might be true. Tsukamoto based the script on conversations he had with popsinger Cocco, who suffers in real life from Kotoko's affliction (albeit thankfully in a much milder version). Cocco herself plays the lead and she is phenomenal, totally disappearing into her role, making us feel for Kotoko even though we increasingly fear her more as the film progresses. In the end, the sheer amount of empathy this film conjures up for its main character forces you to root for this poor woman to succeed somewhat in her endeavors, even though the rational part of your mind wants to put her into an asylum as quickly as possible. Tsukamoto has crafted an intelligent and often heartbreaking film about someone whose affliction alters her view on reality in often unbearable ways. His biggest achievement is possibly the fact that "Kotoko" hasn't turned into a gloomy downward spiral of despair. And somebody give Cocco an award or two. She's deserved it. New Trailer For Shinya Tsukamoto's KOTOKO For Edinburgh Film Festival! I've been following and listening to Cocco's music for some time now and am aware of some of personal struggles. I'm pretty excited to see this. Glad you liked it.